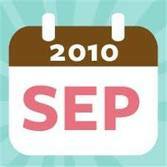 So September in review, there was a lot going on at work, at home and in the blogosphere. It was a crazy month and October may top it! *Listened to my first two audio books, will not be including these in my read per month, but will keep a separate tracking list! *Participated in my first ever blogfest! Sent some Anita Shreve books to Damla in Turkey! *Received a lot of books for review and lined up three author interviews! *Completed my first challenge via Goodreads Red Dress Ink Fan Group - yep I am that girl! Watch out for October - it is going to be one crazy packed month! I really want to read The Accidental Mother. I've also been tinkering in the world of audio books. So far I've found that I enjoy chick lit on audio book that I'm not sure I would enjoy reading.